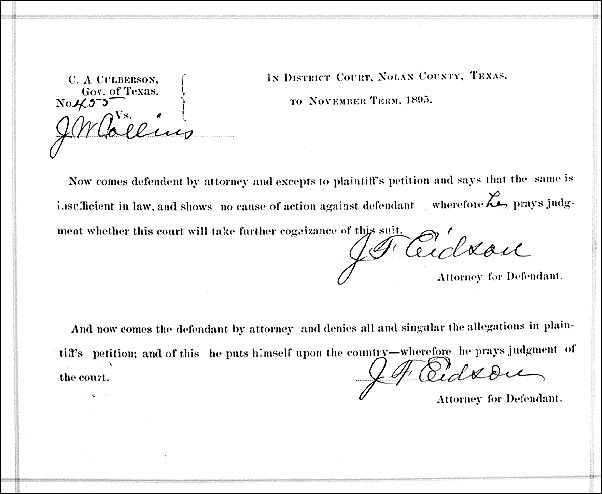 In the April 1895 term of the Nolan County, Texas, District Court, C.A. Culberson, Governor of Texas, filed suit against J.W. Collins. 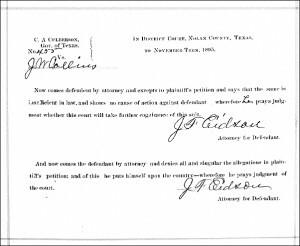 Collins, the suit alleged, was the owner of 160 acres in Nolan County originally sold to J. Asberry Jr. on 17 September 1881 for $1 an acre, with a note for $152 at eight percent interest. Now comes defendant by attorney and excepts to plaintiff’s petition and says that the same is insufficient in law, and shows no cause of action against defendant–wherefore he prays judgment whether this court will take further cognizance of this suit. Okay. Just what the heck does all that mean? The first paragraph actually is easy. The defendant is basically saying, in plain English, “so what if everything the plaintiff says is true? The law won’t let the court take my land away or make me pay that interest.” In today’s legal language, it’s a motion to dismiss for failure to state a claim3 — a statement that, even taking the facts as true, the law favors the defendant and leaves the plaintiff without a legal basis for the lawsuit. But that second paragraph! Sure, the “denies all and singular the allegations in plaintiff’s petition” is clear, but what in the world does it mean that the defendant here “puts himself upon the country”? Where exactly the phrase came from isn’t clear, though it does sound as though it was an appeal to the broader community to judge the case. But wherever it comes from, that’s what it means whenever you see it in a legal document: okay, other side, prove it to the jury. The preposition “upon” caught my eye, and I thought of the familiar phrase in the movies, “I throw myself upon the mercy of the court.” I could see a relationship linguistically? Thanks for such a clear explanation. Yup, and here the “country” is represented by the jurors. Neat, huh? So you left me hanging. Was a jury trial pursued? Did Collins win? And I wonder where the lawyer was from. I’m assuming not Texas. I guess you could infer a ‘winner’ by doing some land record research. But who would have time for that!! I wish I had time to do that research, John! Alas, I still have the issue of an employer who doesn’t understand why genealogy should come first!